Where friendly service and a family atmosphere are never out of date. 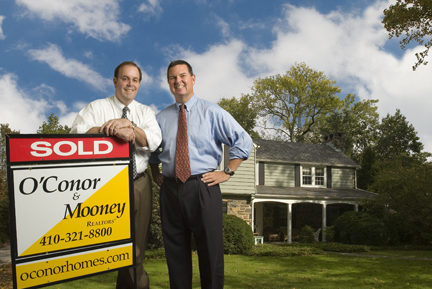 As a locally owned and managed firm, O’Conor, Mooney & Fitzgerald is committed to knowing each and every client they serve. This is a genuinely Baltimore mindset, borne of a genuinely Baltimore legacy, established by two thoroughly Baltimore guys, Tom Mooney and Sean O’Conor. It is enhanced now by the blending of their company with another well-established, independent and locally owned firm, Chase Fitzgerald & Co. Whether you are looking to buy your first home or sell the one you’ve had for 35 years, no one can serve your needs as well as we can. Our agents prefer the client-centered, family-oriented atmosphere rather than the big business approach of other firms, an atmosphere which enables them to put their clients first – in all they do. The process of buying or selling a home can be complex, and everyone has different interests and expectations. We hope you’ll bring yours to us. We know you’ll be happy you did. * We will help you determine the best selling price for your home. * We will suggest what you can do to get your home in top selling condition. * We will recommend reputable repair companies if necessary. * We will develop a strategy to show your home. * We will enter your home in the Multiple List Service immediately. * We will implement a customized marketing plan. * We will meet with you to review progress at least once each month. * We will promptly advise you of changes in market conditions. * We will present all offers to you promptly and assist in evaluating them. * We will monitor progress toward closing when acontract is accepted. * We will immediately advise you of events that may threaten closing. * We will coordinate and monitor the settlement process. * We will monitor the appraisal and buyers' loan approval. * We will stay in contact with the selling agent to make sure things are proceeding smoothly. * We will be present at closing to assure a successful conclusion.